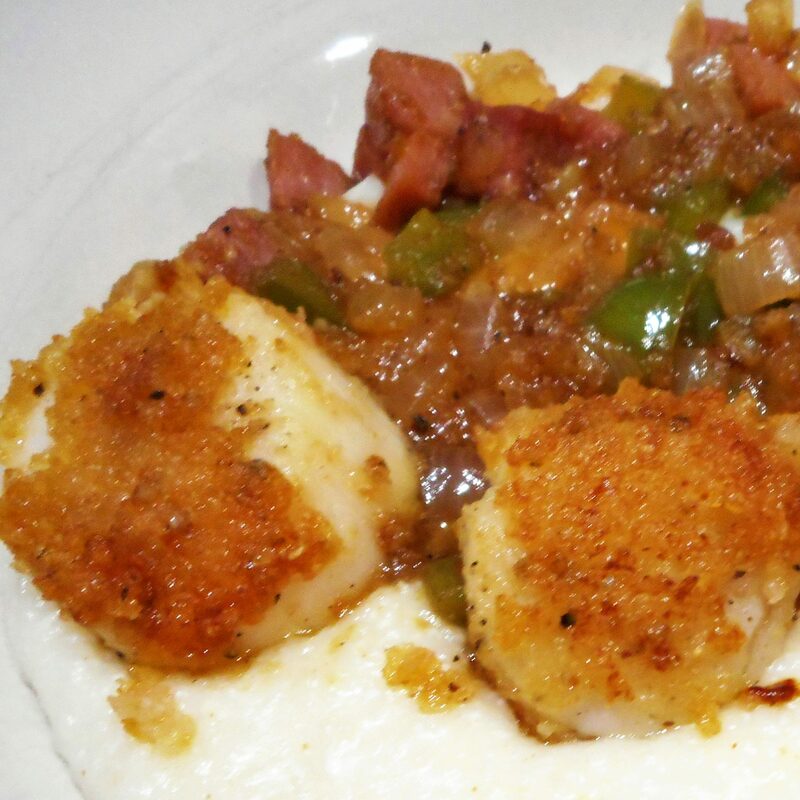 These sea scallops are excellent when served over cheese grits or risotto. Tasso ham can be hard to find, but Country ham makes a good substitute. 1. Place the pork rinds in a food processor and grind into fine crumbs, remove to a plate. 2. Drizzle the scallops with olive oil and season with black pepper to taste. Take each scallop and press top and bottom into the ground pork rinds. As each scallop is crusted, place it on a wire rack set over a baking sheet. Chill the scallops 15 minutes or more. 3. Add butter to a large cast iron skillet on medium heat. Allow the butter to brown, until you smell a nutty fragrance. 4. Place the scallops in the skillet and sear on both sides until crispy and tender about 2 to 3 minutes on both sides. Remove from the skillet and place on a paper towel lined plate. Cover loosely to keep warm. 5. In the same skillet over medium-high heat, add the ham, onions, green peppers and garlic. Sauté the vegetables until softened, about 5 minutes. Add the wine to the skillet and use it to deglaze the pan and scrape up any browned bits of flavor from the bottom of the pan. Allow the wine to cook just a minute or two to take the edge off the alcoholic bite. Season with Creole seasoning to taste. 6. To serve, remove the Tasso ham mixture to serving plates and top with the sea scallops.